Recently, something bad happened, and it isn't as if it has never happened before. When it first happened, I didn't do much about it, because it didn't really affect anyone. First, let's get this through once and for all. The above are strictly the only social media accounts I own. From today and onward, this post will serve as the official statement. Shall I have new accounts in social media of any kind, I will update this list again. Just yesterday, a victim contacted me on Facebook, telling me that someone has been scamming with my identity on WeChat!!! Oh my goodness, her captions made me laugh. She is abusing my photos to fabricate an entirely fake existence of me. She even posts my photos on her WeChat timeline with captions she produced. How do I know it's a she? This person has been calling the victim (let's refer to him as X) every single night, and according to him, it was a girl's voice. X is cheated into a RELATIONSHIP by the impostor. X confessed to me that he has done "a lot of things" for this faker. According to X, they only talked to each other through WeChat. X doesn't have her phone number nor other accounts' username. but she has been producing so much excuses that X eventually got suspicious. So, X finally got in touch with me on Facebook, and everything came to light. I tried to search for the account on WeChat, but that isn't possible. 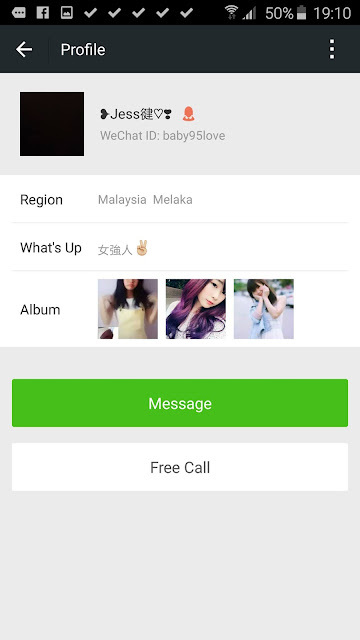 I'm quite sure that she has already turned off the feature that enables an account to be searched by the WeChat ID!! What a clever move huh? Just in case you are wondering, the victim is the one who sent me the screenshots of her WeChat profile and WeChat timeline. but I can at least warn all of you out there. I am really angry. I don't understand why this faker is so free to do all these shits, to scam people with a fake identity. On a side note, I think this faker is a huge follower of mine lolol. 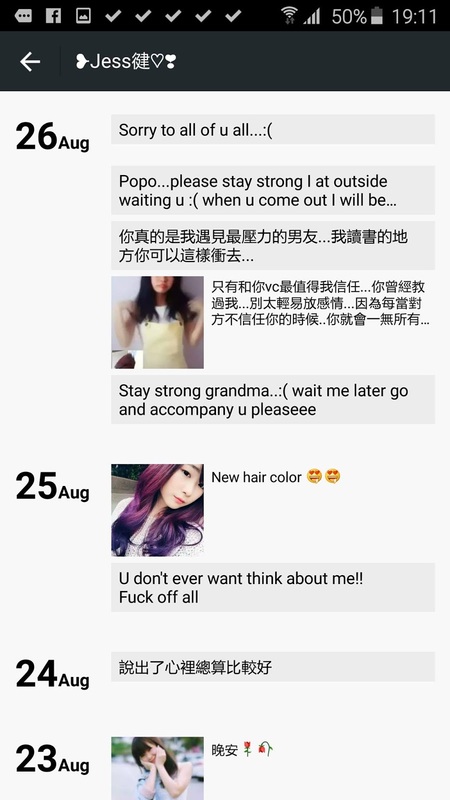 She updated her WeChat timeline with most of my recent pictures, even the ones with my new hair colour. You might be reading this right now. Thank you for following me. You probably love my face so much that you wish to be like me. But if you have enough heart to be human at all, please put an end to your recklessness. Oh and please, GET A ****ING LIFE (and a face). Be careful with every individual you interact with on the Internet. OMG seriously she needs to get a life! Hope it won't happens again to you in the future!